Amed Lodge boasts a uniquely rustic design to complement its natural surroundings. Built to incorporate an admirable collection of old timberwoods presented in a rustic style that reveals a delightfully eclectic architectural. The seven charming cottages comprise with wooden furnishings, queen or single beds and local decorative elements. Each structure is fully air-conditioned for personal comfort and comes with a tropically-inspired bathroom. We have just returned from Amed Lodge and dearly wish we could have stayed longer. What a find! What an ultra-relaxing beachfront treat! Situated in the low- key north east of Bali – a region replete with Balinese culture- Amed Lodge brought back the joys of the ‘old Bali’ we revelled in over 30 years ago. There’s no crowds, no traffic, no unsightly high rises, just a series of villages strung out along an exotic black sand coastline. Amed Lodge is a rarity in that it is unique and stylish yet also supremely comfortable. Our room – called Amed and graced with a balcony that overlooked the sea – was a spacious tactile treat of beautiful timbers and storied antiques and textiles. The resort is intimate and the service is unobtrusive but very efficient and helpful. The vibe is that of having a rustically stylish beachfront haven all to yourself…. : just heavenly. I loved how we could sleep with the doors open and soak up the sound of the little waves. Each room is unique and presents a feast for the eyes and is rare for the detail and care taken. Out the front there is good snorkelling – plenty of fish – and nearby are world =class diving and snorkelling sites such as Japanese Wreck, USS Liberty, numerous coral gardens and at the end of the beach the endlessly intriguing ‘ Wall’ a fantasy of big coral bommies and fish that come in so close they make you giggle out load. Looking forward to de-stressing at Amed Lodge in the future. Love the little lodge by the sea. Clean and at that time very nice and quiet. Very relaxing. Ideal for diving around Amed and Tulamben. We keep having breakfast and dinner there. It’s the kind of place that you can just stay for a couple of days without going anywhere. Beautiful decor. Will definitely come back here again. Great location for diving, exploring & excellent staff! Fall asleep to the sound of crashing waves and awake to breakfast overlooking the beach on your doorstep, delivered by the super helpful and friendly staff. The design, service and homely charm felt in tune with the ‘real Bali’ – for a perfect escape on the east coast from the crowds and commercial west coast. We picked this accommodation for its proximity to the nearby diving and competitive pricing in this range and left impressed by the cleanliness, room size and comfortable beds. Only issue was a tiny sink in our room but the open air, private shower made up for this 🙂 Suksma from A & J! pleasant location, all staff friendly and very helpful, comfortable rooms, soft pillows. very classic accessories. I really enjoyed to relax all day in the room. Once again thank you and highly recommend. I had a truly amazing time here. It’s worth every penny! Really clean, great style, good staff, good location, good food, amazing view. What more could you ask for? I’ll definitely be booking here again. Amed itself is gorgeous! Each cottage is made completely from wood except of the foundation. Look like old traditional houses from Japan, each furnished beautifully. Unlike any other places to stay in Amed. Highly recommended for those who look for something different. The location is fantastic too. Just a short walk to the right on the beach is the magnificent view of Mt.Agung and on the left side on the ocean, you will see the sun rising. The staff friendly and attentive. I enjoyed my stay very much. It doesn’t look much from the entrance, but when you go inside you will amaze with the details of the hotels. You will feel a mixture of Joglo and Chinese touch wooden house. Its very quiet place and all you can hear is the sound wave from the beach. Definitely the place to get away from crowed and just relax. My husband and I stayed at Amed Lodge – Sudamala for four nights and very much enjoyed our stay there. The architecture is unique, with woven bamboo slats and sturdy wooden beams supporting the ceiling. An air-conditioner and a ceiling fan complemented one another. And in addition to a canopy, our room had a beautifully crafted platform bed in solid teak. To top it off, the door to our bathroom had a sliding wooden bolt, taking me back to the days spent at my grandmother’s house, way back when. The team of staff members, headed by Dessy, was very helpful and made us feel at home. They took our order for breakfast with a smile, and accommodated my meticulous instructions for scrambled eggs and cheese on toast. The dining area overlooks the ocean, very calm and serene. Amed Lodge has a well-maintained swimming pool at 1.5 meters in depth at the deepest end, and that’s where we hung out to take a dip. 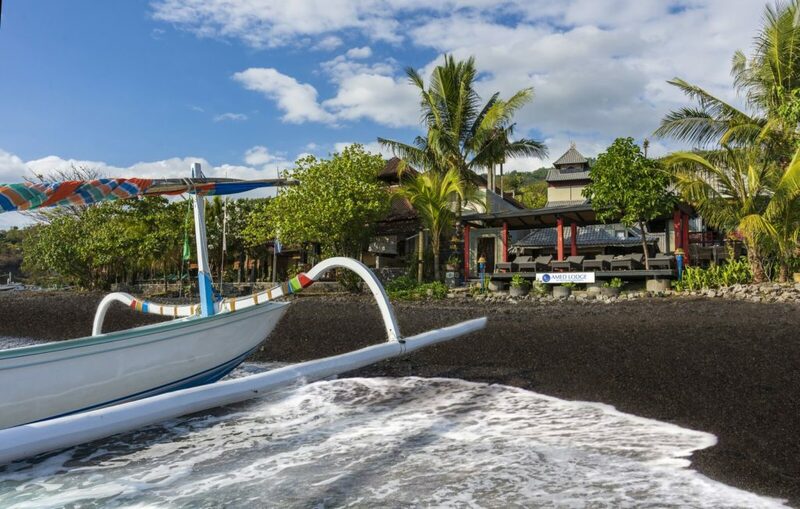 The village of Amed is a 3-hour car ride from Ngurah Rai Airport in Denpasar, Bali. It is well worth the effort to get there, and Amed Lodge – Sudamala is the ideal place to stay. Why Book Direct with Amed Lodge?